My Christmas came early around here y’all. Hubby built me a barnwood mantel. Yes built! Squeal! We got a little electric fire this year and visions of a mantel surround filled my head. It was totally his idea to make it match my barnwood desk hutch. He got to work a couple of weekends ago and I am thrilled with the results. I thought I would show it off with my Christmas decor on it so y’all can see. The character is amazing right? 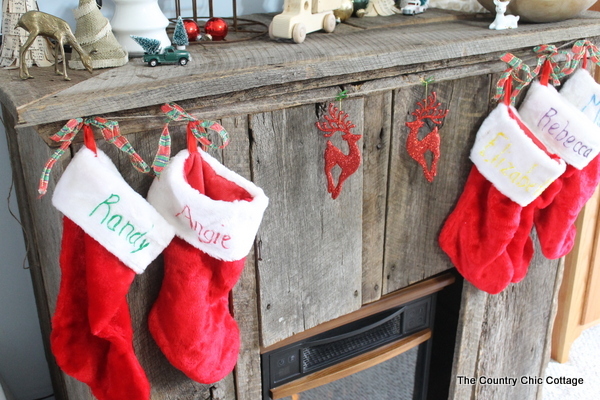 Now our stockings can hang by the chimney with care. We have never been able to say that before y’all. 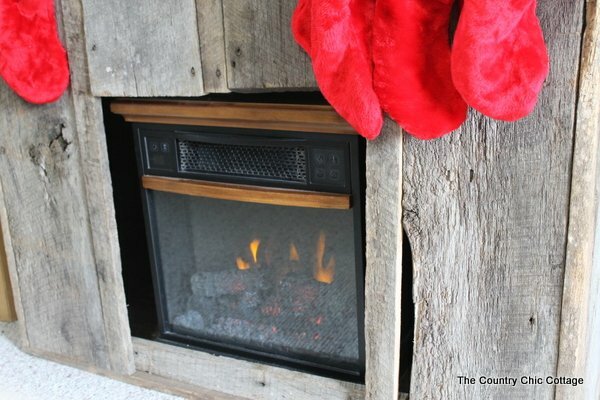 See our little electric fireplace fits inside. Just perfect don’t ya think? Alright let’s talk decor a bit shall we? 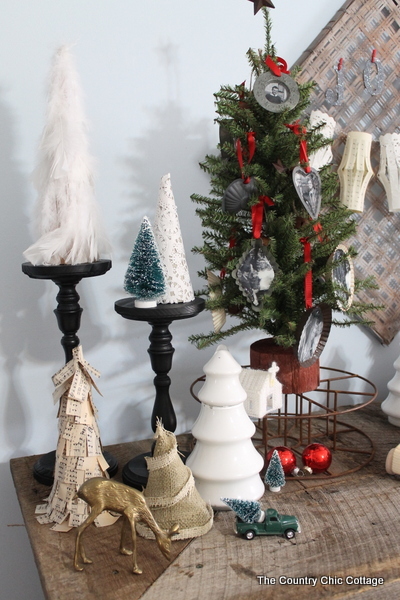 The picture below has my family tree with ornaments, one of my feather trees, a doily tree, Pottery Barn knock off candle holders, my burlap tree, my sheet music shag tree, and my vintage inspired white milk glass tree. 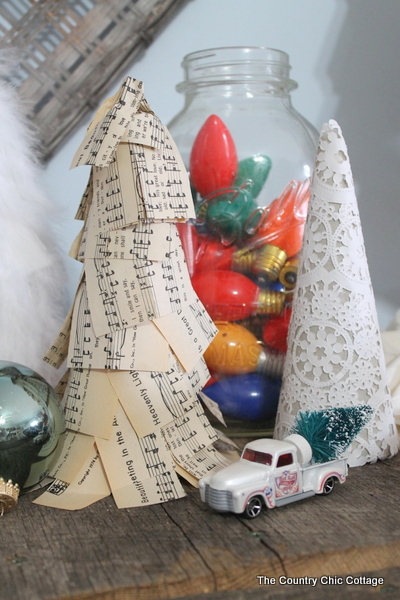 The other side has some of the same elements along with my extra large rolled sheet music tree. I absolutely adore using my son’s small toys to decorate at Christmas. Put a small tree in them and they are ready for display. Plus he loves seeing his toys on the mantel so it is a win win. They are just perfect up here. 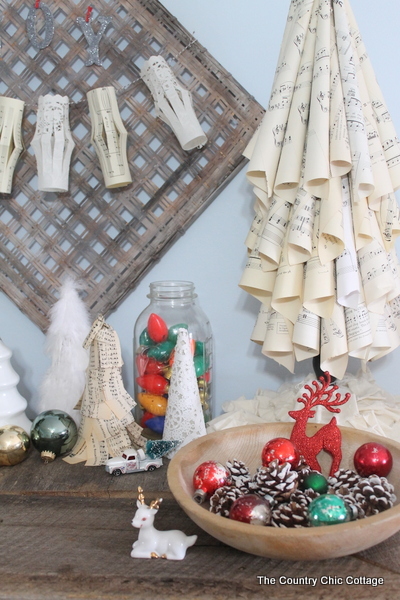 A portion of my sheet music doily garland got added to my knock off tobacco basket on the wall. I also could not resist adding a mason jar. I have collected these old light bulbs over the years and love adding them to a mason jar. I hope you have enjoyed my Christmas mantel! 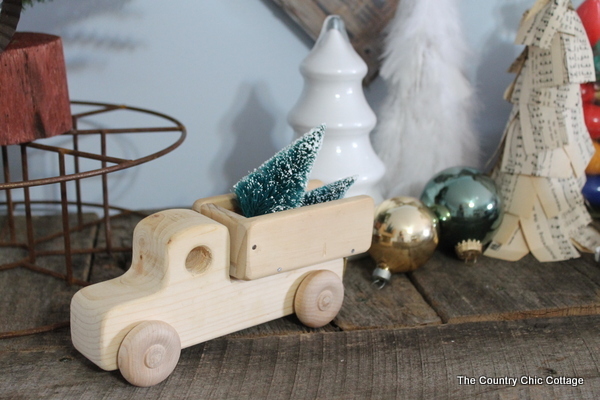 You will be seeing this barnwood beauty tons in the future! previous post: Button Ornaments with Kids plus a GIVEAWAY to stuff your stocking! Gorgeous mantel your husband built. And I do love those toys. 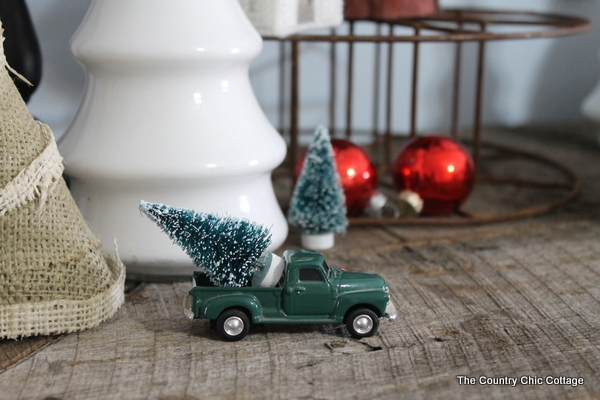 Those little trucks hauling trees are so adorable. Wow! 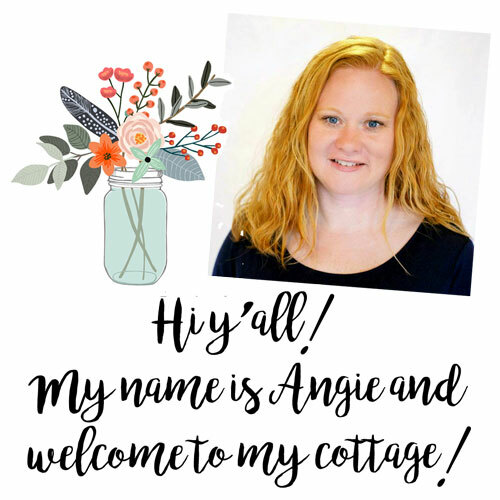 Great job, Angie! Love the barnwood and your vintage decorating is so cute too! 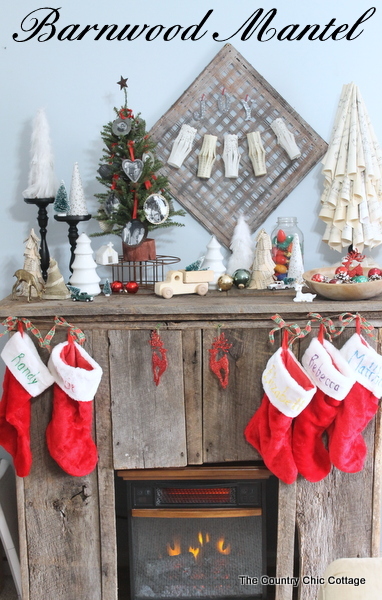 Oh Angie, you’ve done a wonderful job with your Christmas mantle – it’s beautiful! I LOVE your new mantel. It’s beautiful! Gorgeous mantel ~ Love it!! !